Bromsgrove | A balanced diet . . .
One thing has caught my attention while out exploring Bromsgrove (in northeast Worcestershire) on foot: how few public houses (or pubs as they are more commonly known) there are in the town. My walks cover an area within a 1½ to 2 mile radius from home, encompassing the town center and immediate surrounding area. If one was to visit every pub within this area of Bromsgrove (each marked with a green beer mug on the map), and drank a half pint of beer in each, it would be quite an achievement to become inebriated, or as the colloquial saying goes, ‘one over the eight‘. There are just 13 pubs within easy walking distance of home, and the majority lie on the Birmingham-Worcester Roads close to the town center. There were a few more pubs in the past, but that does not explain the low number (much less than half) compared to Congleton in east Cheshire (where I was born in 1948) and Leek in North Staffordshire, where my family moved in 1956. These towns have many more pubs than Bromsgrove, with around 30+ and between 50 and 60, respectively. When I was growing up in Leek and living in the Market Place in the 1960s, there were at least a dozen pubs within just a couple of hundred meters from home. Why can’t I provide accurate pub counts? Well, based on the information I’ve received, it depends on what is classified as a pub, and the area taken into account. For the purposes of this post, I’m considering only Bromsgrove pubs in a ‘traditional’ sense, i.e., a premises (often owned by a brewery) where one can walk in and order a glass of beer at the bar. And they often have an interesting or quirky name, such The Red Lion, The Duke of York, or Dog & Pheasant, for example. Many pubs have become eating places as well and, for some, the sale of beer and other beverages is almost secondary now to the catering side of the business. I have not considered wine bars and the like as ‘pubs’. We have a few of these in Bromsgrove. Congleton, Leek, and Bromsgrove are old market towns, and have a comparable population: 26,500 for Congleton; 20,800 for Leek, and 29,000 for Bromsgrove (census data from 2011 and 2001). However, if the wider Bromsgrove/Catshill urban area is taken into consideration (that I always think of as ‘Bromsgrove’) then its population is almost 40,000. Tracing the drinking history of any town can be interesting, but not without its pitfalls. It has been achieved successfully, however, by Leek local historian, Neil Collingwood, who recently published a book about the town’s pubs. Leek apparently has boasted 150 pubs over the centuries! As far as Bromsgrove is concerned, I have marked (in the map below) all the pubs I come across during my walks (within that 1½-2 mile radius) with a green beer mug symbol; except for my local, The Red Lion which has a red beer mug. Those outside my normal routes, or too far on foot, are shown in purple. Black beer mugs indicate pubs that have closed. Just expand the map to see more detail. There is at least one image for each pub; just click on the beer mug symbol. Many of these images I have taken myself, but others were captured (under fair use) from Google Maps Streetview, and acknowledged thus. It’s interesting to note, but not surprising, that many of the pubs follow the route of the main highway south from Birmingham through Bromsgrove to Worcester. This is/was the A38 Birmingham Road/Worcester Road that bisects the town into two almost equal west and east sides. And I guess some of the hostelries must have catered to coaches and their passengers before the railway came to Bromsgrove in June 1840, east of the town. The Ladybird (formerly The Dragoon) was built at Aston Fields in 1905 to serve the railway. It’s close to the site of the old station. In 2016, the new station opened a few hundred meters south. The Ladybird at Aston Fields. The access road to the rail station (New Road) is on the right. New Road/Kidderminster Road bisect the town almost equally north and south, and meet the A38 in the town center at the High Street, now closed permanently to traffic (but was still open when we moved to Bromsgrove in 1981). The A38 was also diverted around the town along the Bromsgrove Eastern By-Pass (A38) around the same year. The Red Lion on Bromsgrove High Street, right in the center of town, is a 10 minute walk or so from home. It serves great beer, and always has several ‘guest’ beers on tap. It used to be quite dingy (although the beer has always been good). The 2007 smoking ban made such a difference, when the landlord took the opportunity to refurbish inside. It has undergone a couple more internal facelifts since then. All this interest in pubs must give the impression that I’m always frequenting one or another. Not so! In fact I have only been in four of the pubs shown on the map. Besides The Red Lion, I’ve been in The Ladybird (enjoying several pints of Bathams Bitter) a few times. Steph and I once went to The Gate Hangs Well southeast from Bromsgrove. It closed at least a couple of years ago, and is marked on the map as a black beer mug outlier. And then there’s The Swan, shown in purple at the northern range of symbols on the map, in Fairfield. We used to go there during our home-leaves for a meal and some good Marstons Bitter. But we haven’t been there in recent years. Memo to self: I should research all these pubs some more—both physically and through searching historical accounts on the Internet. So why are there fewer pubs in Bromgrove? Well, the only thing that comes readily to mind is the difference between Congleton/Leek and Bromsgrove in terms of industry. Both Congleton and Leek were once textile towns, with thriving silk weaving mills (and others); Leek also had dye works exploiting the soft water flowing in the River Churnet. These industries declined since the 1960s. Were so many pubs opened to serve workers in these mills? While many of the workers would have been women at one time, surely when they opened and expanded in the 19th century many more men were occupied then. Many dry throats to satisfy. Bromsgrove had a lot of cottage industries, such as nail making and the like. But not the widespread industrial employment that characterized Congleton and Leek. Apart from the forge works, known as Garringtons. In 1946, Garringtons acquired Deritend Stamping Limited of Newton Works, Bromsgrove [established in 1940] in order to expand production of castings for the automotive industry. Newton Works eventually covered 50 acres, and gave employment to 3,100 people. The works (United Engineering Forgings) closed in 2002. Garringtons was sited on the east side of the town (map), south of and alongside the mainline railway. Since its closure, the Garringtons site has been redeveloped for housing known collectively as Breme Park. There were no pubs near Garringtons, apart from The Ladybird, and the Aston Fields Sports & Social Club on Stoke Road (shown as a blue beer mug on the map). I’m not sure if one has to be a member of the club to drink there. The Sugarbrook used to stand at the crossroads of the A38 By-Pass and Charford and Stoke Roads. I’m not sure when it was first built. It was demolished in 2012 and the site now boasts a KFC drive thru! As I’ve said, there’s more research to be carried out. I’ll post again as and when I uncover more details. I’ve just discovered two more pubs. One, the Golden Lion, is on Austin Road on the Charford district, just over a mile south of home. But an area I’ve never walked before. The other, the Royal Oak, is on the north side of town in Catshill. When Steph and I moved back to the UK in 1981 from Peru, we had to find somewhere to live that was not too far from Birmingham. I’d been appointed to a Lectureship in the Department of Plant Biology, so needed a base from which to conveniently commute. We’d already decided that we didn’t want to live in Birmingham, so began to look in the area covered by an arc from the west, south and southeast of the city. Bromsgrove, some 13 or so miles south of Birmingham, was the first town we visited. It’s a straightforward drive south from the university, and was an obvious first choice. In any case, we’d already seen some property flyers for a couple of properties there that had caught our attention. And in less than a week we had settled on the house that we bought. And we have ‘lived’ there since July of that year. I say ‘lived’ because a decade later I accepted a position at the International Rice Research Institute in the Philippines. For almost 19 years, our house remained empty (although fully furnished) until we moved back on my retirement in April 2010. I then realized just how little of Bromsgrove I actually knew, or had explored during the 1980s. I also needed some activity to keep me fit. In the Philippines I’d been reasonably active in the decade leading up to my retirement, enjoying scuba diving, badminton twice a week, and swimming at the weekends. So I took to walking on a daily basis (mostly). And I try to walk a minimum of two miles or 45 minutes each outing, often quite a bit more, and began to explore Bromsgrove. Our home lies to the east of Bromsgrove town center, near the junction of New Road and the Bromsgrove Eastern By-Pass (A38). My Bromsgrove walks cover an area within a 1½ to 2 mile radius from home, west almost to the M5 motorway, and east to the Worcester and Birmingham canal. Here is a small sample of five walks that I have made in the past ten days. I have plotted each of the routes in Google maps, with red via points indicating that a photo (maybe two or three) is attached. Just click on a red point to open the image. I have added grey via points to fill in some of the ‘gaps’ in the routes. This is one of my frequent railway walks, taking in the bridge over the mainline to Worcester and the West Country. I had actually planned a much longer walk on this day, but when I arrived at the bridge, I discovered that further progress was blocked as the public footpath had been closed (indicated with a blue via point). The bridge used to be a great location for trainspotting, but since electrification of the line, safety barriers have been constructed on all three bridges over the railway restricting the view from each. 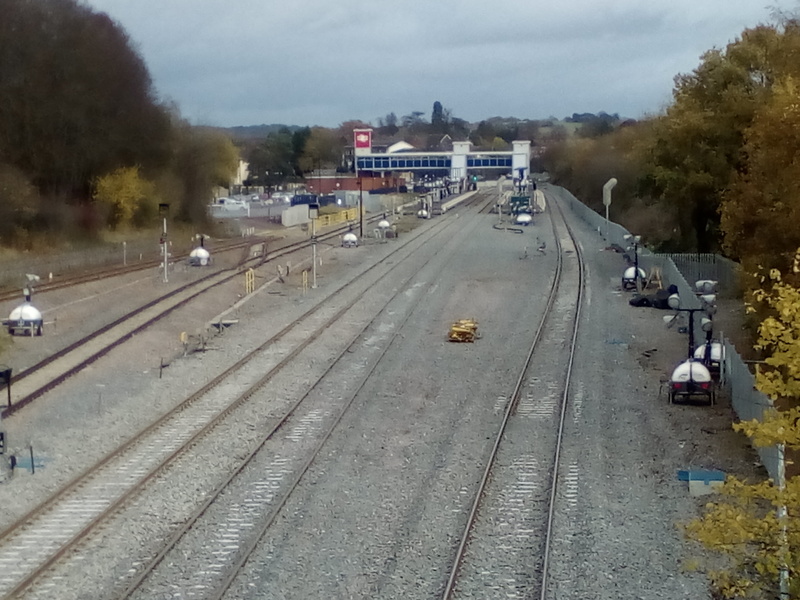 Looking north towards the new station at Bromsgrove, that was ‘electrified’ in 2017. From the bridge, this walk eventually ends up at the roundabout in Aston Fields. On this occasion, I followed the footpath alongside the railway to join Finstall Road a little way north. Then it was back home from there. 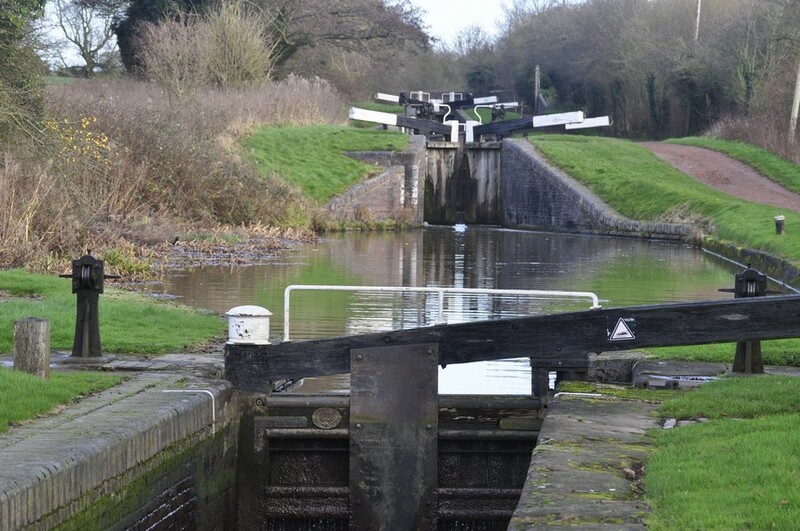 This is one of my longer walks, as far as the Worcester and Birmingham Canal (constructed in 1815), north along part the Tardebigge flight of 30 locks (the longest in the UK over 2 miles), as far as the Tardebigge Reservoir, then west back across the fields to home. A narrowboat passes through the lock below Tardebigge Reservoir (that supplies water to the canal). From here, this walk takes me west towards home. This is a route that I’ve walked on just a few occasions, taking me to the northwest of the town center. But it’s interesting to see that side of the town, where urban and rural meet, and farmers are ploughing their fields and keeping sheep, right up against the M5 motorway. Then I head south back towards Sanders Park on the south side of the town center, and from there back along the by-pass to home. This the public bridleway connecting Perryfields Road with Crabmill Lane. The fields either side were sown with barley in 2018. 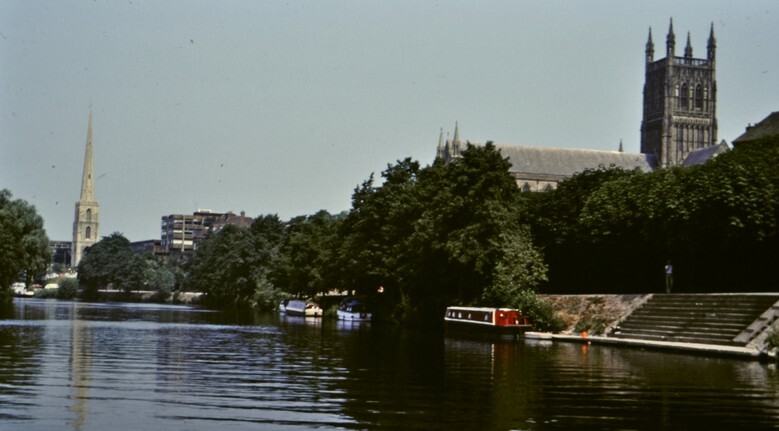 The spire of St John’s Church can be seen on the horizon, left of center. This walk follows a route along New Road into Bromsgrove town center, then through the High Street, on to the Stourbridge Road, before heading southeast once again and back home. 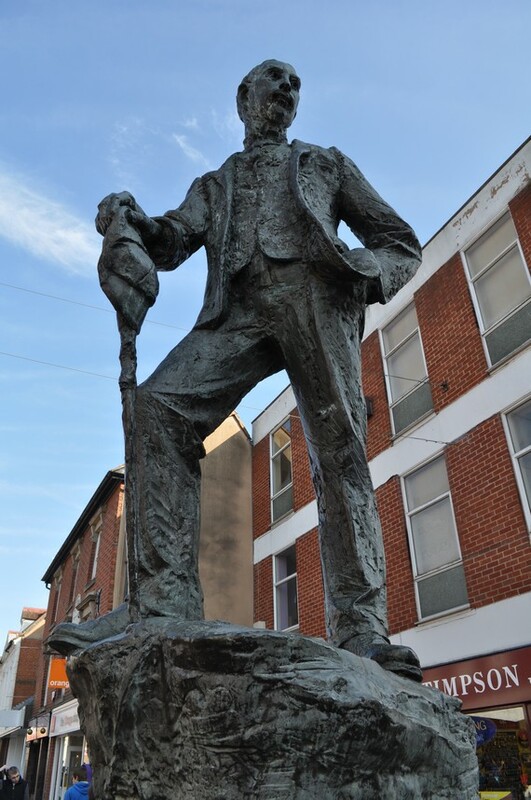 The statue of Bromsgrove poet AE Housman in the center of the High Street. All Saints’ Church on the Birmingham Road. I’d set out on this walk intending just to take a few photos for another blog post I’m preparing. But since it was such a fine day, I decided to venture further afield, mainly south from home. Looking north along Rock Hill towards Bromsgrove town center. The spire of St John’s Church can be seen on the center horizon. This spire dominates the Bromsgrove landscape for miles around. Until I retired in April 2010 (aged 61) I had been quite active in the previous decade, playing badminton twice a week, and swimming at the weekends. As you can imagine playing badminton was quite strenuous in the heat and humidity (>30ºC/>80%RH) of Los Baños in the Philippines (where I worked for 19 years at the International Rice Research Institute). However, when Steph and returned to the UK, to our home in Bromsgrove in northeast Worcestershire (about 13 miles south of Birmingham city center), I needed to find some other form of exercise. So, almost religiously since then, I have walked an average of 2 miles a day, around 45 minutes, at about 2.8 mph. Some days I don’t go out, especially if the weather is inclement, but other days, I may walk three to four miles or more. And I have taken these opportunities to explore my ‘home’ town, visiting areas I had never visited when we lived here in the 1980s. To some extent, the same old walks have become somewhat stale, the same routes, so I always enjoy when we decide to go further afield (by car in the first instance) and then make a long walk. 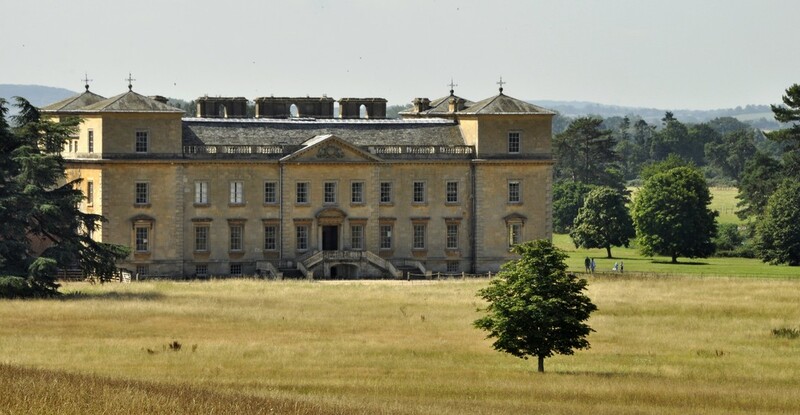 The parks at two national Trust properties, Hanbury Hall and Croome Park (7 and 20 miles from home, respectively) offer good long walks and beautiful landscapes. Walks around Bromsgrove are mostly less photographically attractive, in the main, but there is a number of interesting landmarks that are worth documenting. So, with this in mind, I’ve decided to begin a series of blogs, Walking with my mobile, in which I will illustrate the various walks that I make, with photos linked to the various via points added to a map for each. Today’s walk, just over 2 miles and taking 44 minutes, was a test, as it were, of what I intend to do. I had thought of taking my Nikon D5000 DSLR camera (18-200mm) camera with me. But for a routine walk it’s rather heavy. So I decided to use my mobile phone camera. In 2016 I acquired my first smartphone. It’s a Doogee X5pro, running Android 5.1, with 4.92MP camera, not the high resolution that is standard on much higher spec (and considerably more expensive) phones. But for the purposes of my walks, I reckon these images will be fine. See what you think. Click on any of the via points to open an image or two. And this is what I’ll do in subsequent Walking with my mobile posts. Each red point has an image associated with it; the grey points just fill in some of the gaps in the route. I’ve got a bee in my bonnet, and it won’t go away. Buzz, buzz, buzz. Let me explain. Please bear with me. My home town, Bromsgrove, lies at the foot of the Lickey Hills in north Worcestershire (map). The rail mainline from Birmingham to the southwest (through Worcester and Cheltenham, on to Bristol and the West Country) passes to the east of the town, having descended the Lickey Incline, ‘the steepest sustained main-line railway incline in Great Britain. The climb is a gradient of 1 in 37.7 (2.65% or 26.5‰ or 1.52°) for a continuous distance of two miles (3.2 km)’. A new station was opened in 2016, and the line was subsequently electrified. The new electric trains (operated by West Midlands Railways in their bright gold and silvery grey livery) came into service in July 2018 as part of the Cross City line connecting Bromsgrove with Lichfield to the north of Birmingham. I wrote a blog post about the station in 2016, and updated it last November. There are three bridges over the railway near the new station, one to the south (at a housing development known as Breme Park that had been built on the site of the former Garringtons Ltd or United Engineering Forgings), and two to the north (one over St Godwald’s Road, and the other over the B4184, Finstall Road), indicated by arrows on the map below. 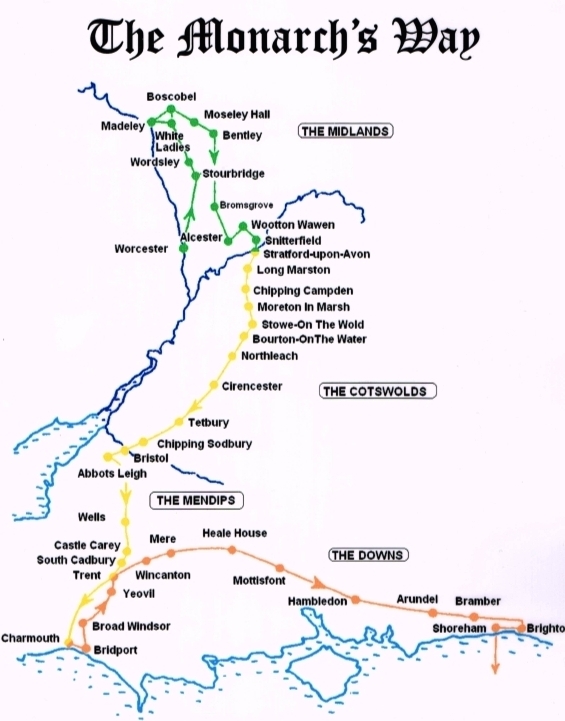 All three bridges are owned by Network Rail, which ‘own[s] and operate[s] the railway infrastructure in England, Wales and Scotland on behalf of the nation. That’s 20,000 miles of track, 30,000 bridges and viaducts and thousands of tunnels, signals, level crossings and points’. Until recently these bridges were great vantage points to watch rail traffic up and down the Lickey Incline. No longer. During the installation the overhead electrification it wasn’t necessary to raise any of the three bridges in Bromsgrove. However, as a safety feature to prevent anyone leaning over the parapets, steel cladding was erected on both sides of each bridge, as illustrated in this photo to the right. I didn’t manage to take any photos of the bridges with all this cladding, but you can now imagine what it must have looked like. Very unsightly. Now the cladding has been replaced on all three bridges—for better or worse. That’s why a bee is busy buzzing. Let me show you, bridge by bridge. To the south of the station, there is a steel and brick bridge that connects with public footpaths on the east side. It’s just a muddy track, but wide enough for a vehicle to cross. From here was the perfect spot to watch trains approaching, at speed, round the bend from the south. Almost all the steel cladding has gone, except at each end of the bridge on both sides. I cannot understand why Network Rail would leave the bridge with four sets of steel cladding, unless workmen will return at a later date to replace the remain panels. Click on each image to enlarge. In the center and right below, can be seen the view, north and south from the bridge, from the ends of the bridge. On the left is the view south towards the bridge from the station platform. Just north of the station (close to where the old station was sited until 2016), a concrete bridge crosses St Godwald’s Road. On the top of the parapet has been placed a single course of ‘plastic bricks’. Since the parapet itself is flat, Network Rail made a better job here. It wasn’t so complicated. Yet, on the rail side of the north parapet, there is much to be desired, as the ‘bricks’ don’t appear to be fully secured. Then there is the bridge further north carrying the B4184 Finstall Road over the mainline. This is actually a concrete structure, but the parapets were faced with pink sandstone blocks that have weathered over the decades, and are in keeping with the surrounding area. But what a botched job Network Rail has made of placing a course of ‘bricks’ on the top of each parapet. This a view of the bridge from the south (rail) side. On the bridge itself, south and north sides, it’s hard to believe that anyone signed off on this as a completed job, well done. Just look at how they have placed the ‘bricks’. Let’s look at the south side first. And on the north side, it’s almost as bad. And in the process, some of the stonework has been damaged. To their credit, Network Rail did reply within an hour, and through emails they have now referred this issue to a local team to investigate: Your service request has been assigned to our RAM Structures team to investigate further. They will report back shortly with their findings and your local contact and communities team will be in contact to confirm the next steps in due course. There’s even a job number, #190121-000205. Nothing has happened yet, but I’ll keep monitoring the situation—and bugging Network Rail—until the buzzing has gone away*. But why have I become so incensed about this situation? The casual use of resources is unacceptable in these difficult fiscal times. But maybe I’m just becoming a grumpy old fart. I have no idea what budget was allocated to, firstly, install the steel cladding, and secondly, the replacement panels and ‘bricks’. Thousands of pounds, undoubtedly. How many person-days so far? And, for the bridge on the Finstall Road, because there is a pavement on only one side (the south) the road had to be partially closed (with traffic signals) for about three weeks, disrupting traffic for the local community. But as I’ve already said, I can’t imagine how anyone could think that this workmanship was acceptable, up to standard. And that goes against my sensibilities of doing something right the first time! These are the only views now possible from the bridge on St Godwald’s Road. The middle image below was taken from the car park of the old station, and shows a West Midlands Railways train departing from Platform 3, and then crossing over on to the up line. Diesel trains (shown here) to and from Hereford via Worcester stop at Bromsgrove. Thank you for your recent communication to our National Helpline on the 21 January 2019. 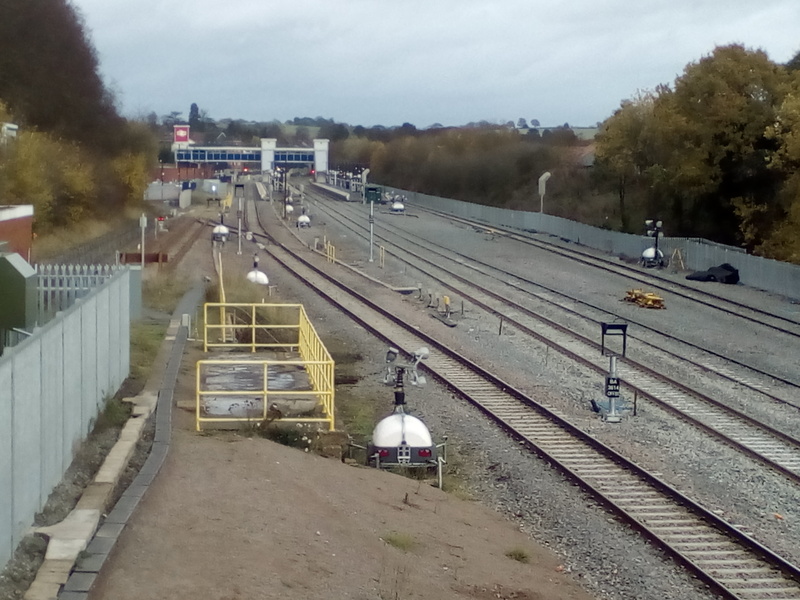 As part of the scope of works of the Bromsgrove electrification, our project team have had to ensure that at all bridges over the railway a minimum of 1.8 metre high parapets have to be in place to protect users of the bridge from the presence of live electrification equipment below. From July 2018 this was permanently energised at 25,000 volts. In some cases (such as the new Bromsgrove station footbridge and newly-reconstructed bridges in the Barnt Green and Blackwell areas), this height separation has been provided from new. At bridges which have not needed to be reconstructed, we have raised the heights of the parapets, there being three such structures in the Bromsgrove area. The designs for parapet height extension have gone through a number of approval processes, which have taken some time. Temporary steel screening has been installed at the bridges – including Finstall Road – to provide the necessary separation in the interim between energisation of the electrification and the approval and delivery of the permanent works. Planning consent has been sought and received, with an inert colour incorporated into the material used (GRP). Volker Rail is the contractor undertaking the works (under subcontract to MPB), and over a number of weekends has progressively installed the cladding and when able, removed the temporary steel cladding. As per the photos supplied by you the temporary gaps left between the GRP panels, some of which were filled in the interim with plywood panels, were of work still in progress whilst the GRP ones were being fabricated. While I appreciate this may not be the answer that you were hoping for, and there may still be some work outstanding, the work to date is as per the design. For the rest of your enquiry about the costs involved in this project, if you would like to pursue this information, we would kindly request for you to make a separate enquiry as this would require a Freedom of Information request. Now, there’s a couple of points I’d like to make. First, I have never questioned the necessity of meeting health and safety issues by installing raised parapets. I completely see the need for these, while feeling disappointed (along with many others, I’m sure) that the views up and down the Lickey Incline have now been reduced or lost. Second, the reply from Network Rail is ambiguous whether the job at the bridges is a ‘work in progress’ and yet to completed, or whether this is now the finished article, so to speak. If it’s a ‘work in progress’ I’m surprised that Network Rail did not agree with the contractor (Volker Rail) a more convenient start date when all the materials necessary for the job had been assembled. If the contractor has to return that will mean more expense and road closure inconvenience perhaps. While out for a short walk yesterday I decided to check if any more work had been carried out on the bridge on the Finstall Road. I’d noticed that the parapet on the south side had been repaired a week earlier. And I was pleasantly surprised to see that the north side had also now been brought up to standard. Parapets on the south side of the bridge. Network Rail seemed pleased with my tweet. Elgar’s county – a land of hope and glory? Where Worcestershire Sauce was first concocted. But Worcestershire is also the birthplace (just outside Worcester) in 1857 of Sir Edward Elgar, one of the nation’s most renowned composers. Bounded on the north by the West Midlands and Staffordshire, to the northwest by Shropshire, Herefordshire to the west, Gloucestershire to the south, and Shakespeare’s county, Warwickshire to the east, Worcestershire is a mainly rural county in the English Midlands. It has an area of 672 square miles, and is 38th out of 48 counties in size. Click on the map below to explore further. The estimated population (in 2016) was a little under 600,000. Ethnically it’s mostly white British (>91%). Worcestershire is my home, but I’m not a native. I was born and raised in Cheshire and Staffordshire, some 70 miles to the north. My wife hails from Essex, east of London. We chose Worcestershire—Bromsgrove in the northeast of the county to be specific (shown by the blue star on the map above)—more by chance than design. Let me explain. In March 1981, Steph, Hannah (almost three), and I returned to the UK after living more than eight years in Peru and Costa Rica. I’d just been appointed to a lectureship at The University of Birmingham, in the Department of Plant Biology, School of Biological Sciences. Until we found somewhere to live permanently, Steph and Hannah stayed with her parents in Southend-on-Sea, while I settled into lecturing life at Birmingham. And launch ourselves into the housing market. Before we left Peru, we had asked Steph’s parents to contact on our behalf as many estate agents (realtors) as they could identify from locations in a wide arc from the west of Birmingham, south into Worcestershire, and southeast towards the Solihull area. We already had decided that we didn’t want to live in Birmingham itself. Arriving back in the UK we encountered a very large pile of house specs waiting for us at Steph’s parents, and began to work our way through these, rejecting immediately any that did not meet our expected needs. We quickly whittled around 500 down to a handful of fewer than fifty or so. It must have been the Wednesday of my first week at the university in April, a slack period with no lectures or practical classes scheduled. So I decided to take the afternoon off and go house viewing. But in which direction to strike out? Bromsgrove is just 13 miles south of the university, connected by the A38, a route that crosses the city right by the university in Edgbaston. We had selected a couple of properties in Bromsgrove that seemed promising, and the drive there was likely to be the easiest of any of the other locations on our list. So I made appointments that same afternoon to view these two properties. And the first house I saw was the one we actually ended up buying. It just ticked all the boxes. Later that evening I phoned Steph to tell her what I’d been up to, and that she should schedule to come up to Birmingham on the train as soon as possible to take a look for herself. Within a week we’d made an offer for the house, and started to sort out a mortgage—at 16¾% interest in the first year or so! Our younger daughter, Philippa, was born in Bromsgrove in 1982. New house, new baby! In July 1991, I accepted a position at the International Rice Research Institute in the Philippines, and we stayed there until April 2010, almost 19 years. All the while we kept our home in Bromsgrove, fully furnished, but unoccupied, and available for us to return to whenever we came home on annual leave, and to take up residence once again on retirement. 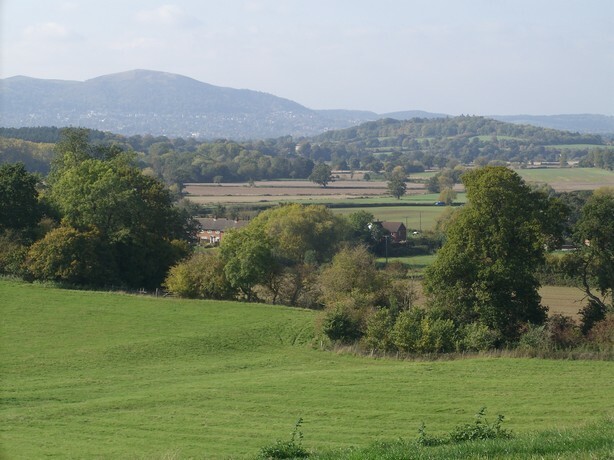 Worcestershire is a lovely county, dotted with picturesque villages, rolling hills in the north and west, magnificent river valleys slicing through the landscape, and fertile agricultural land to the southeast. We’ve never regretted making the choice to move here. Being located in the middle of England, it’s not too far from anywhere. Our younger daughter lives in Newcastle upon Tyne in the northeast, a smidgen under 250 miles away. And during their lifetime, visiting Steph’s parents in Essex, just 160 miles away, was an (mostly) easy trip. Over the past seven years of retirement, we are enjoying getting out and about to explore not only our ‘home’ county, but also places within a 80-100 mile radius for day trips. Worcestershire has few urban areas. 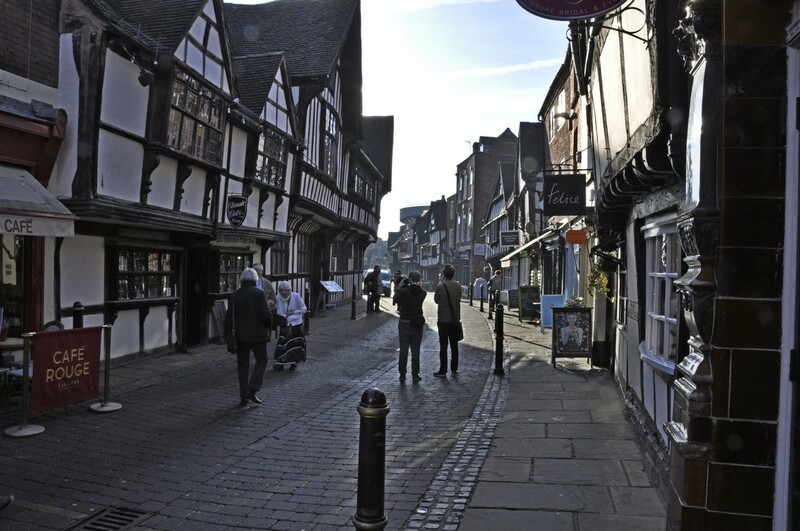 The City of Worcester lies in the center of the county, just 16 miles south of Bromsgrove. It’s the seat of the county council, and also of the Diocese of Worcester and its magnificent cathedral. There are six local government authorities: 1. Worcester; 2. Malvern Hills; 3. Wyre Forest; 4. Bromsgrove; 5. Redditch; and 6. Wychavon. There are seven parliamentary constituencies, all held by Conservative politicians. That says a lot about the county. The Member of Parliament for the Bromsgrove constituency is Sajid Javid, Secretary of State for Communities and Local Government, a member of the Cabinet, and once considered as a high flyer and Tory Party leadership contender. His star has waned somewhat. Bromsgrove is famous for its 17th century nail-making industry, and the iron gates of Buckingham Palace¹ made by the Bromsgove Guild of Applied Arts. Carpet-making Kidderminster is nine miles to the west of Bromsgrove. Redditch, nine miles to the east, was home from the 18th century to a needle-making industry, and Droitwich Spa, founded on extensive salt and brine deposits, lies about six miles south. In the far south of the county, market town Evesham serves the agricultural community in the fertile Vale of Evesham. Geographically, Worcestershire has some important features. England’s longest river, the Severn, enters the county northwest of Kidderminster (south of Bridgnorth), and flows for some 45 miles south before reaching the Severn Estuary in Gloucestershire and beyond. The River Avon (Shakespeare’s Avon) meanders east to west across the southern part of the county, round Evesham and to the north of Bredon Hill, before joining the Severn at Tewksbury in Gloucestershire. In the north of the county, to the north and west of Bromsgrove, the Lickey Hills (between Bromsgrove and Birmingham) and Clent Hills rise to 978 and 1037 feet, respectively. On a clear day, the view from the top of Clent can be spectacular, as far as the Black Mountains of South Wales. The view south towards the Malvern Hills (on the right), the Severn Estuary, and the Cotswolds (on the left). Looking further west towards Abberley Hill, beyond Great Witley. Straddling the county border between Worcestershire and Herefordshire, the Malvern Hills are an easily recognisable north-south spine, rising to over 1300 feet, and offering an unsurpassed panorama over the Severn Valley to the east, and the Cotswolds further southeast. The Malverns (R) looking south to Bredon Hill (center) and the Cotswolds, and the Vale of Evesham, from just south of Great Witley. This is a view, to the west, of the northern section of the Malverns and the Severn Valley from the Panorama Tower (designed by James Wyatt in 1801) at Croome. In the south of the county, Bredon Hill (at 981 feet) is a Jurassic limestone outlier of the Cotswolds, affording views north and east over the Vale of Evesham, and south to the steep north-facing escarpment of the Cotswolds proper. This is the view from Broadway Hill, looking north over the Vale of Evesham, with Bredon Hill on the left. Horticulturally, the Vale of Evesham is one of the most important areas in the country, famous for its extensive orchards of apples, pears, and plums, vegetables (especially asparagus), and hop gardens, among others. Worcestershire is also ‘home’ to The Archers, an every day story of country folk, based on villages close to Bromsgrove. In the northwest of the county, and spreading into Shropshire, the Wyre Forest is an important semi-natural woodland, and Site of Special Scientific Interest (SSSI). It covers an area of about 10 square miles. Summer visitors to Worcestershire must be very high indeed, but perhaps for just an hour at most as they cross the county. That’s because the M5 motorway is a 32 mile corridor ferrying holidaymakers south to the West Country or north to Lancashire, the Lake District, and Scotland. Worcestershire has two other motorways. A section of the M42 (the southern orbital around Birmingham) passes north of Bromsgrove, and joins the M5 there. The M50, in the southwest of the county, branches off the M5 and takes traffic west into Herefordshire and south to South Wales. Worcestershire has two particular transport claims to fame. Running north-south, just over a mile east of Bromsgrove town center, the main-line railway (connecting Birmingham with Bristol and the southwest) traverses the Lickey Incline (currently being electrified as far as Bromsgrove), the steepest sustained main-line incline in Great Britain, for a little over two miles, at 2.65%. The Incline was first surveyed, but then abandoned, by Isambard Kingdom Brunel in 1832 as a route for the Birmingham & Gloucester Railway. Just a little further east, the Worcester & Birmingham Canal, completed in 1815, connects the River Severn at Worcester with Canal Basin in the heart of Birmingham, a distance of 29 miles. 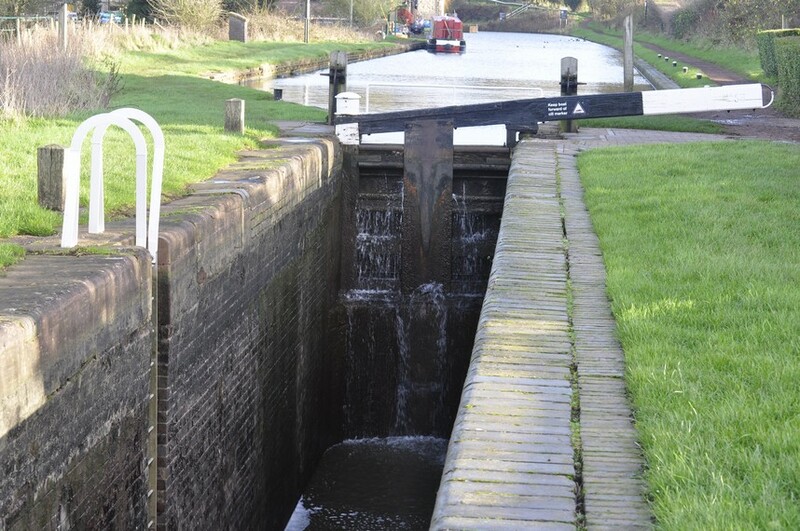 The 30 lock Tardebigge Flight, close to Bromsgrove, is the longest flight of locks in the UK. I have written about both the Lickey Incline and the canal here. The view from Tardebigge church (above Tardebigge Top Lock) over Bromsgrove to the Malverns (in the southwest on the left) and to Clee Hill (due west, in Shropshire) in the distance. Another canal, the 46 mile long Staffordshire & Worcestershire Canal (completed in 1771) branches from the River Severn at Stourport on Severn, crosses the northwest part of the county through Kidderminster, eventually joining the Trent and Mersey Canal at Great Haywood in Staffordshire. This was a vital link for 18th century industry. Earlier I mentioned Sir Edward Elgar. He is perhaps the most famous son of Worcestershire. He was appointed the first professor of Music at The University of Birmingham in 1905. The Elgar Concert Hall at the university, opened in 2012, is named after him. It is one of the venues in The Bramall that sits alongside the university’s Great Hall, an extension of the Aston Webb building, completing the red-brick semi-circle vision of Sir Joseph Chamberlain, which has been at the heart of the University since 1909. In addition to his Pomp and Circumstance Marches, Elgar is also renowned for his Enigma Variations, composed in 1898/99 (0f which the evocative Nimrod must be the most loved). But I think his tour de force must be his Cello Concerto in E minor, Op. 85 played in this video by Jacqueline du Pré, one of the 20th century’s most talented musicians. Classical scholar and poet Alfred Edward Housman was born in Fockbury, just outside Bromsgrove in 1859. His most famous cycle of poems is A Shropshire Lad, first published in 1896. His statue stands proudly over the High Street in Bromsgrove. Conservative politician and Prime Minister at the time of the abdication of Edward VIII in 1936, Stanley Baldwin was born in Bewdley in 1857. Roland Hill, credited with the concept of a modern postal service, and the postage stamp, was born in Kidderminster in 1795. William Morris, later Lord Nuffield, and motor magnate and philanthropist, was born in Worcester in 1877. Led Zeppelin’s Robert Plant was born in Kidderminster in 1948, actor Charles Dance (born 1946) hails from Redditch, and Sting’s wife Trudie Styler was born in Bromsgrove in 1956. Historically, Worcestershire has much to offer. Two major—and pivotal—battles were fought in the county. In August 1265, the forces of Simon de Montfort, 6th Earl of Leicester were defeated at the Battle of Evesham by the army of King Henry III led by his son Edward, later Edward I. Almost 400 years later, in the final battle of the English Civil Wars, the forces of King Charles II (who wasn’t restored to the crown until 1660) were defeated at Worcester in 1651 by Oliver Cromwell’s Parliamentarian New Model Army. Today, the Monarch’s Way is a long distance footpath (>600 miles) that traces the route of Charles II’s escape after his defeat at the Battle of Worcester. Earlier this year we visited Boscobel House in Shropshire (the furthest north Charles fled) where he hid in an oak tree. The Monarch’s Way crosses the Worcester & Birmingham Canal in places, and passes through Pepper Wood, just west of Bromsgrove. Standing proudly above the River Severn in the center of Worcester, the cathedral is the final resting place of King John (of Magna Carta fame). 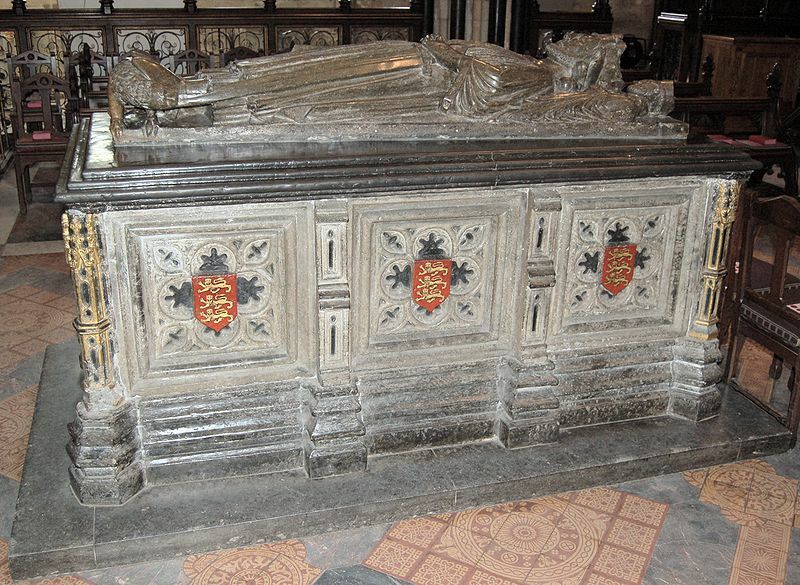 The tomb of King John in Worcester Cathedral. The cathedral was built between 1084 and 1504, combining different architectural styles from Norman to Perpendicular Gothic. There are many other abbeys and religious buildings throughout the county, most destroyed during the Dissolution of the Monasteries by Henry VIII in the sixteenth century. 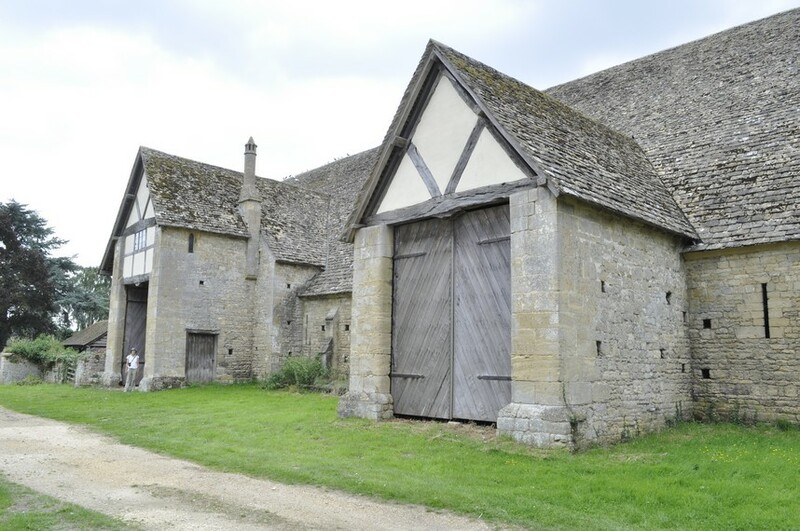 There are two outstanding medieval threshing barns standing in the south of the county, near Bredon, and at Littleton near Evesham, as well as good examples of dovecotes at Hawford and Wichenford (both owned by the National Trust). 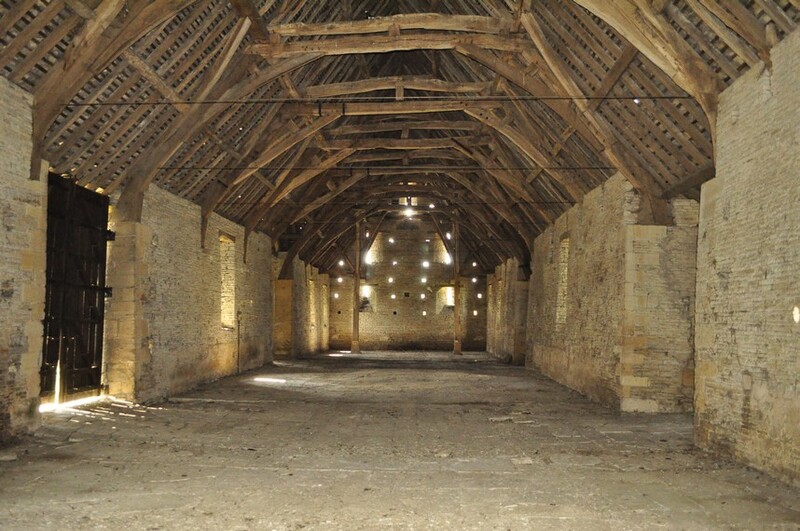 The medieval barn at Bredon. The roof of Littleton barn. Hawford dovecote on the left, and Wichenford on the right. One of the oldest public schools (i.e. private school) in the country, Bromsgrove School, was founded as a chantry school in 1476, and re-founded in 1553. It takes pupils from all over the world, but despite occupying a large chunk of real estate in the town, seems to have very little connection with the community (even though it’s quite often featured in the local weekly newspapers). The National Trust also owns two large estates in Worcestershire at Hanbury Hall (just seven miles southwest of Bromsgrove), and Croome Court, southeast of Worcester. Both are impressive 18th century houses. Greyfriars is a medieval merchant’s house and walled garden in the center of Worcester. Hanbury Hall, built in 1701. Croome Court, home of the 6th Earl of Coventry, and the first park designed by Lancelot ‘Capability’ Brown. Looking south along Friar Street in Worcester. Greyfriars is the double gabled building on the left. 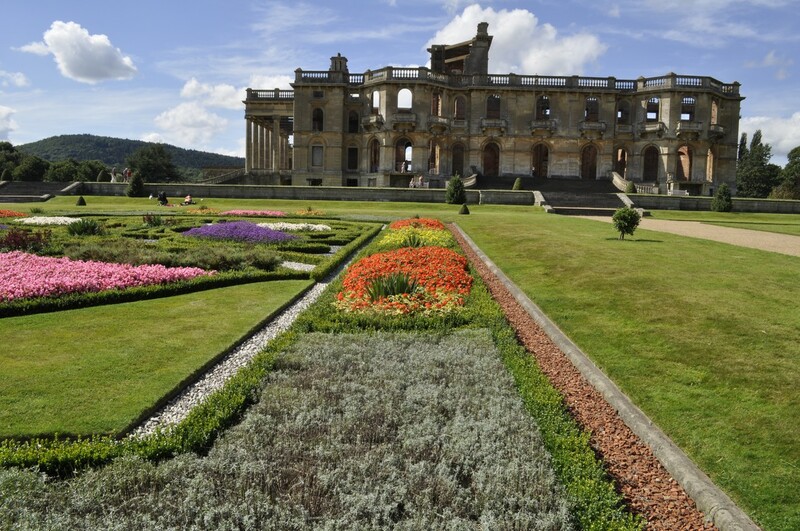 At Great Whitley, some 16 miles west of Bromsgrove, stand the ruins of Witley Court, owned by English Heritage, destroyed by a catastrophic fire in 1937. It has become a favorite place for us to visit, since the early 1980s when we moved to the county. 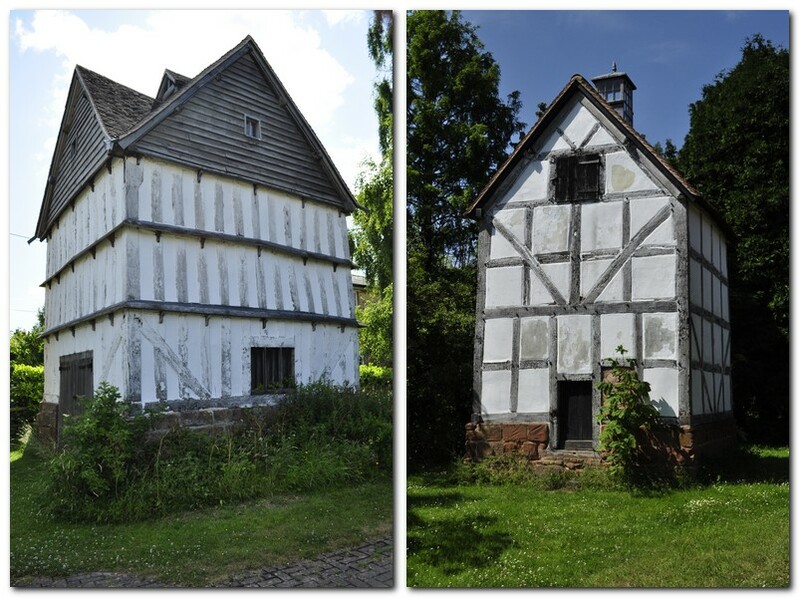 We have yet to visit the only other English Heritage property in Worcestershire, Leigh Court Barn. The heritage, standard gauge Severn Valley Railway, formed in 1965, runs 16 miles from Kidderminster to Bridgnorth, beside the River Severn, with intermediate stops at several picturesque stations. It’s a delightful way to spend the day, with the opportunity for a good walk around Bridgnorth before returning to Kidderminster. Worcestershire has such a lot to offer, and to some extent we have just scratched the surface. We look forward to many more years of getting to know this corner of England we call home. Land of hope and glory? Much of Worcestershire is glorious. Hope? Well, while this Conservative government remains in power, and facing Brexit, there’s little optimism for hope, especially with all Worcestershire MPs being members of the Conservative Party. 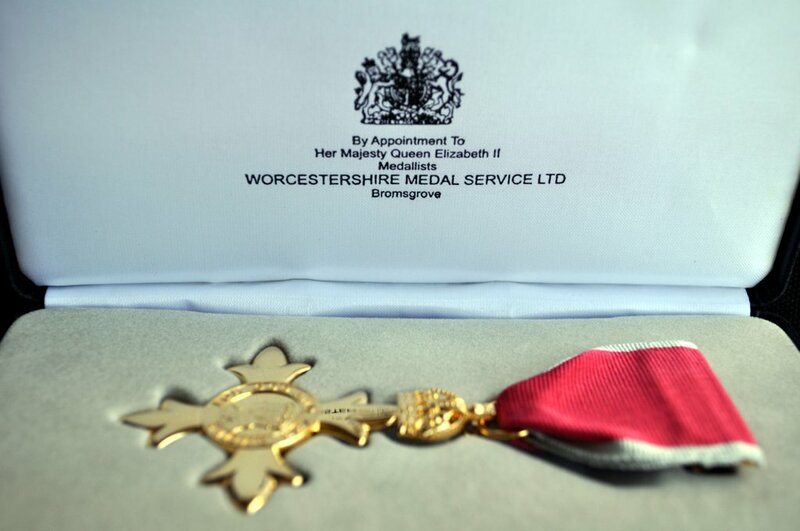 ¹ In February 2012, I attended an investiture at Buckingham Palace and received an OBE from HRH The Prince of Wales. In this post-investiture photo in front of the gates at Buckingham Palace, I’m wearing the OBE medal, which is made by Worcestershire Medal Service based in Bromsgrove. 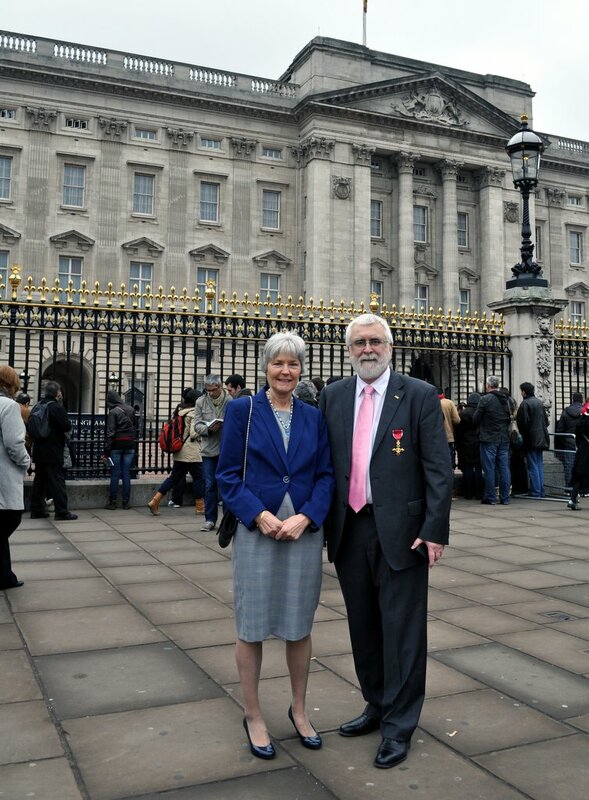 With Steph on 29 February 2012 outside Buckingham Palace after the OBE investiture. It has taken about three years or more to complete, but finally, on 12 July 2016, Bromsgrove’s new railway station in northeast Worcestershire opened for business as the first train pulled in, on time, at 6:21 am. So, 176 years after the first station opened on what was then the Birmingham and Gloucester Railway, Bromsgrove has a new station worthy of the 21st century, and managed by London Midland. Bromsgrove station in 1960, looking south to where the new railway station has been constructed. Bromsgrove’s one platform station in 1981. Bromsgrove station in 2012, looking north up the Lickey Incline, taken from the down line platform. As with many infrastructure projects nowadays it seems, there have been several delays in completing this project. The station should have opened by Autumn 2015. Built on the site of the old carriage works, hidden signalling cables and a previously unmapped culvert required extensive additional engineering works to resolve these issues. In addition, hundreds of tonnes of oil-contaminated soil had to be removed from the site. Now Bromsgrove proudly boasts of a modern, four platform station provided with lift access to all platforms, a ticket office, bicycle store, toilets, and parking for over 300 cars (payable by the day, week, month or annually). Regular bus services will connect the station with the town center over a mile away. The new station replaces a two platform facility that was upgraded from a single platform (on the up line, towards Birmingham New Street) in the mid-1980s. Until then, trains on the down line (towards Worcester) were diverted on to the up line for the short period necessary to disembark and take on new passengers. Not the most convenient situation, as you can imagine, and one that led to serious traffic restrictions on this busy main line connecting the West Midlands with the south west (Gloucester, Bristol, South Wales, and beyond). The station is about half a mile from my home, but I rarely used the train when I taught at the University of Birmingham in the 1980s. Even though the trains from Bromsgrove to Birmingham stopped at only one other station: University (right in the heart of the University of Birmingham campus, essentially). The old station, at the foot of the famous Lickey Incline could accommodate trains with only three carriages. 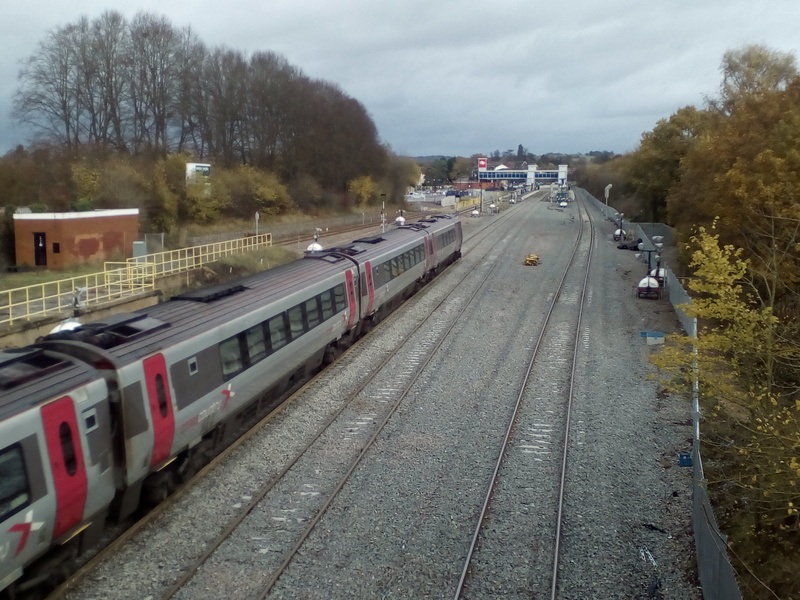 The new station has the length for six carriage trains, and once the electrification of the line has been extended from Barnt Green at the top of the Incline to Bromsgrove, a schedule of four or more trains per hour can be accommodated. Not only will stopping trains park on one of the platform branch platforms, thus permitting express through trains to keep to their schedule, but electric trains will be able to tackle the Lickey Incline faster from a standing start¹, unlike today’s diesel trains that chug up the Incline somewhat sedately. The final platform branch line will not open until October this year, and new signalling installed. The mainline will be closed for two weeks. The final branch could not be laid until the old station closed as the curve into the fourth platform has to begin from where the old down line platform was located. Work has already begun, the old station platforms demolished, and the rails already laid ready to link into the main line later this year. 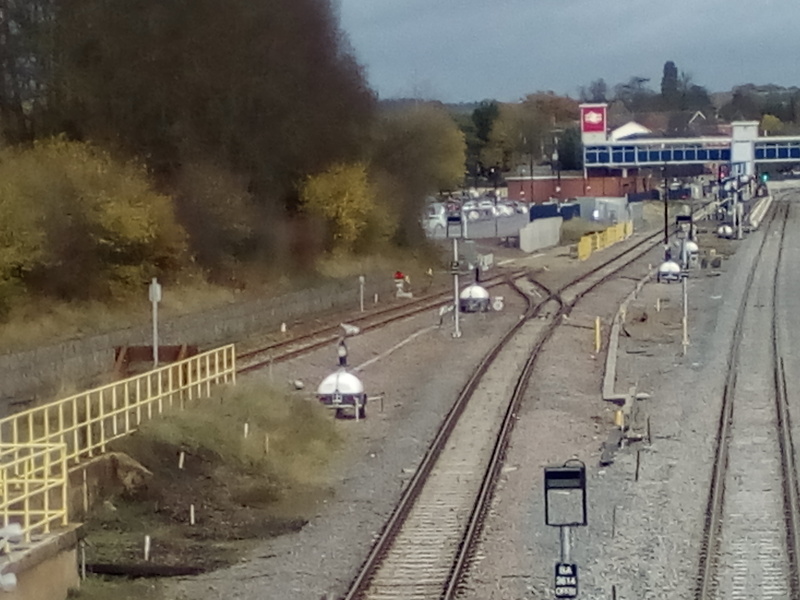 The track laying and realignment are now complete, and new signalling has been installed. 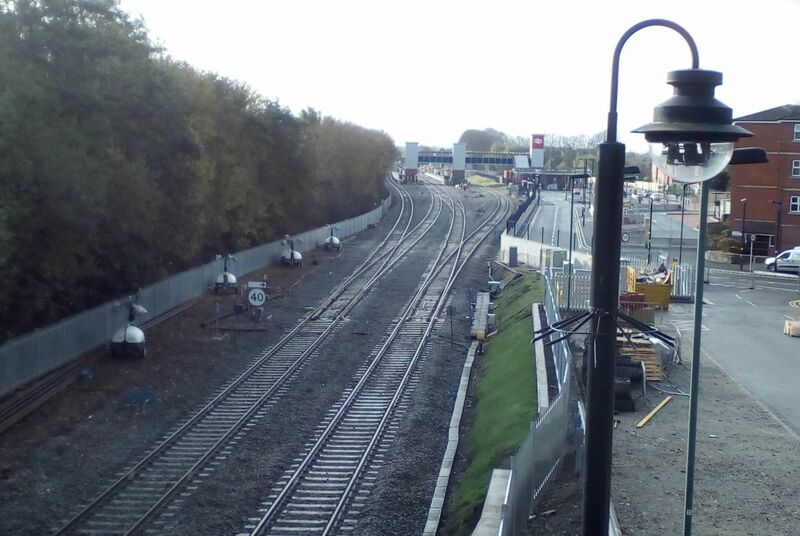 We just wait for the electrification of the line to Bromsgrove, which should be completed by this time next year. Much to my surprise, the new main down does in fact diverge from the old main down through the new Platform 4. You can see where that track was about to be laid in the photos above. And here is the track layout today. The old station was situated immediately below the bridge from where this photo was taken, looking south to the new station. South of the station, looking north to the station, you can see the new track layout, with the new through down on the right. Just south of the station, and on the left of this photo is a small siding for ‘bankers’—locomotives that add power to freight trains waiting to climb the Lickey Incline. They sit at the rear and gives a well-deserved push. Here’s a video from YouTube that illustrates what I mean (before the new station was built and track layout changed. However, this freight train was waiting on the freight loop that has been realigned in the recent work). Also, the freight loop, that passes through Platform 1, is on the left. Electrification finally came to Bromsgrove at the end of July 2018. There had been serious delays, and Bromsgrove commuters were becoming increasingly angry about the delays to their promised new services. But the overhead wires were finally installed and went live at the end of May to permit testing of the new installations and driver training before the implementation of the new services. 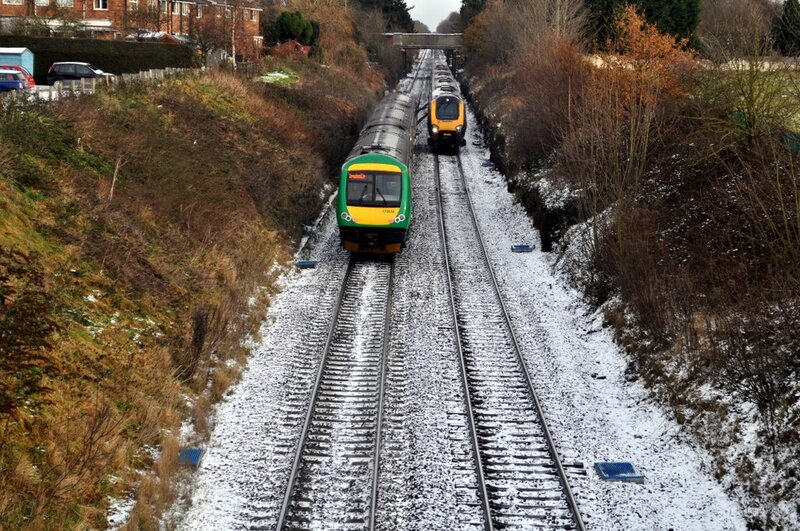 Over the next few weeks, empty trains passed between Birmingham and Bromsgrove. Bromsgrove is now served by West Midlands Railway, and there are five trains an hour into Birmingham New Street at peak times. Some are Class 323 electric units on the Cross City Line (that now connects Bromsgrove with Lichfield to the north of Birmingham), others are the same old diesel-powered Class 170 units that connect Bromsgrove with Birmingham and Hereford.